I have the last six polishes from the new collections released by Aussie brand JOSS. I think that this collection of six polishes is my favorite of the bunch. The colours are so bright a vivid and the mixes are quite unique in me collection. 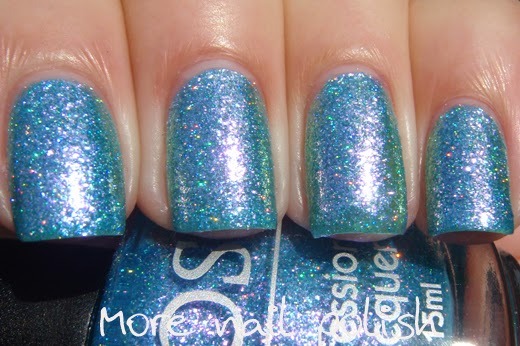 778- Fashionista Statement - a bright raspberry pink with a blue shimmer and an ultra fine holographic glitter. Nicely pigmented and easy to apply. This is two coats with Seche Vite. 779 Desert Sunset - A bronze to yellow duochrome glass fleck with ultra fine holographic glitter. I love this one so much. The duochrome colours are obvious without having to layer it, but you could easily layer one coat over a dark colour to get an even more dramatic effect. Its warm tones would really appeal to those wanting to wear Fall colours. This is two coats with Seche Vite. 780 In a Violet Haze - a silver to violet duochrome glass fleck with ultra fine holographic glitter.The instant my mum saw this one, she fell in love with it, and I've not seen the bottle since. She loves layering one coat over just about anything. This is two coats with Seche Vite. 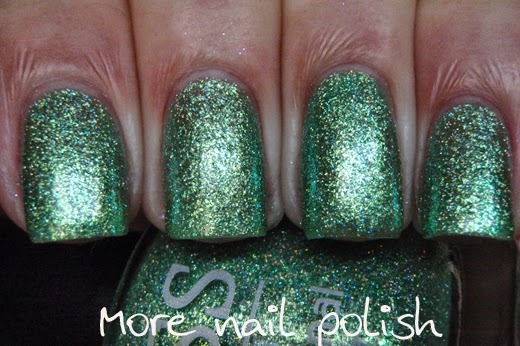 781 Magic Potion - a medium green glass fleck with ultra fine holographic glitter. This is the green version of the previous two polishes. Amazing reflective and shiney green glass flecks with a scattered holo shimmer. 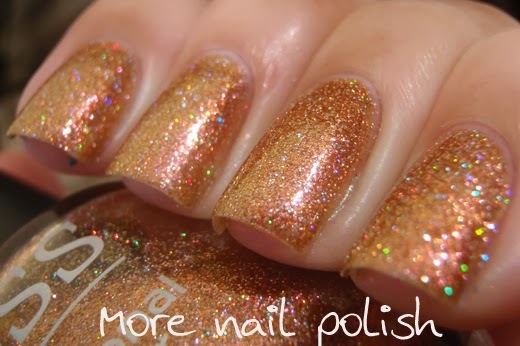 The polishes dry completely smooth, so you can't feel any grittiness from the glass flecks or the glitters. This is two coats with Seche Vite. 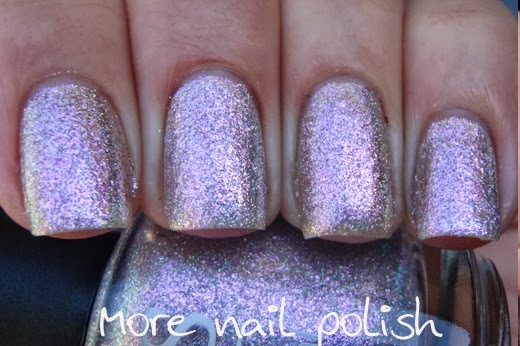 782 A Calming Influence -a medium purple shimmer with ultra fine holographic glitter. This one doesn't have the same glass fleck appearance as the others, it's more of a dense shimmer with holo glitter in it. 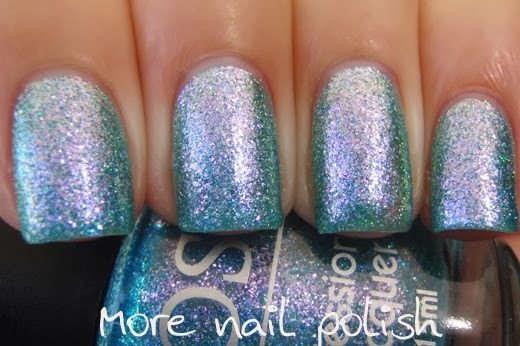 783 In a Mermaids Dream - a blue to violet glass fleck duochrome with ultra fine holographic glitter. This one is back to the same appearance as Desert Susnet, In a Violet Haze and Magic Potion. The duochrome shift is very obvious and this is another one that would look pretty spectacular layered over a dark colour. This is two coats with Seche Vite. Photos really don't do these polishes justice. They look spectacular in the bottle and even better on the nail. These are all available in Australia from Beauty World for just $6.95. Four of there also stocked by Llarowe, but it looks like only In a Violet Haze and Desert Sunset are still in stock - which are personally my two favorites from the bunch. Beautiful collection, particularly knowing they are smooth with a single layer of top coat. Ohhh desert sunset and mermaids dream are fantastic!